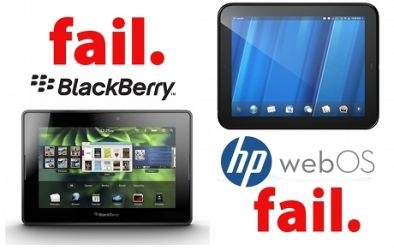 "Someday, not very far in the future, in business school, the tales of both the BlackBerry PlayBook and the HP TouchPad will both be told. It will be recounted that when it finally came time for both of these companies to execute in their attempts to adequately compete with Apple’s iPad and Google Android Tablets, they both failed miserably." Two hot tablets have come to market, and both are being panned by many writers are pale comparisons to the iPad 2, Android tablets, and even the original iPad. While the PlayBook and TouchPad can hardly be considered great successes, it should be noted that they both are operating off of relatively new operating systems. The hardware buried inside these babies seems to be pretty comparable to other tablets on the market, but what they have in hardware, they seem to lack in software. They do not have the wonderful polish that Apple puts on its products, and they haven't had the experience and numerous releases that Android has gone through to adapt to the tablet. If either BlackBerry or HP are committed to the market, we might see these tablets given a chance to mature, and possibly, act as serious contenders for your tablet dollars.